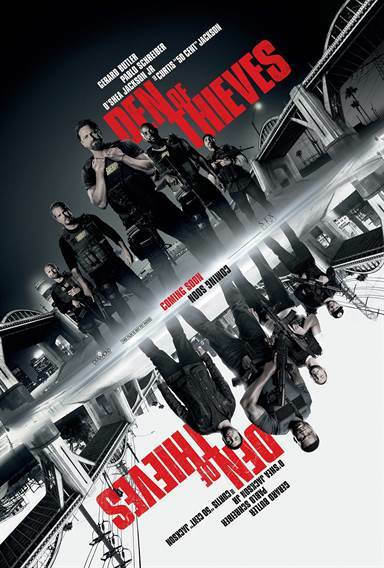 Download Den of Thieves in Digital HD from the iTunes store. Den of Thieves images are © STX Entertainment. All Rights Reserved. Ever since the first trailer for Den of Thieves was released back in October 2017, the comparisons have been plentiful. (A bucketful from Butler alone.) What's certain is that if you've seen any of the trailers (and, surely, once you see the film), you'll find similarities of your own. Now, imagine...you're excitedly/reluctantly (doesn't matter) viewing the film. Regardless, your feeling like the mark in a high-intensity heist medley of "some better forgotten" dispersed throughout "it'll never compare to"s long after settling into a great film of its own because we're all accustomed to the proverbial shoe that falls short. This shoe, it turns out, is of substantial size and fit; and, won't leave you walking home barefoot. Unless you're in Florida, where you might find yourself walking home along the shore, but now I've digressed far too deep in the calceological. After building a reputation in Hollywood for completing rewrites (often uncredited) and enhancing production on multiple major studio releases, Christian Gudegast (Writer/Director/Executive Producer) makes his directorial debut on Den of Thieves. Just as the film is woven from a myriad, so was the production with both mutual and kindred experiences. Producers Tucker Tooley (The Space Between Us; Limitless; The Fighter) and Mark Canton (Power; Escape Plan; 300; Cake) were committed to having this film made from the moment they joined the project (in 2006 and 2008, respectively). Having known him for close to 20 years, Tooley produced the first movie that Gudegast wrote. After seeing not only how prepared he was for every aspect of the film, but the sheer thoroughness, Canton was as steadfast as Tooley that Gudegast direct. After a robbery gone bad in which "rogue" Outlaw Bosco (Evan Jones; Guardians of The Galaxy 2; 8 Mile) kills an armored guard, a shootout ensues resulting in the death of responding police officers. The Outlaws manage to retreat to their lair in spite of the disastrous events. Back at home base, the tension is stifling. The Outlaws have lost one of their own, and become cop killers with one wrong move. That's not who the Outlaws are. They aren't cop killers. They aren't killers at all. They are merely in it for the money, and the thrill of the ride to get it. Former military, the Outlaws plan and execute their heists with the precision and expertise acquired within their special ops units. Described as "preternaturally calm" in production notes, Pablo Schreiber (The Wire; American Gods) elicits a self-assuredness as leader of the Outlaws, Ray Merriman, that remains seemingly unperturbed throughout the exponentially intensifying chess match with the Regulators' boss, "Big" Nick O'Brien who is portrayed by Gerard Butler (London Has Fallen; 300; P.S. I Love You). "Big Nick" runs a "Major Crimes" squad of the Los Angeles Sheriff's Dept. Not just any squad, this is an elite squad…THE squad. They refer to themselves as the Regulators and have branded themselves as such with ink. Merriman tells his men to "get to know your enemy boys" as he informs them, "we got a problem. Every big-time crew that's been busted, these are the guys who took ‘em down." That's when the true vexing begins in an incessant, relentless and intoxicatingly methodical game of escalating psychological chess moves that keeps the audience speculating as to who will "checkmate." As Schreiber put it at the film's screening, "I try to walk softly and carry a big stick." Jokes aside (or, front & center), that he does. I don't say it lightly, either. In spite of an expansive and impressive inventory of roles to his credit (most of which I have seen), I did not think I would ever be able to see past George "Pornstache" Mendez, but his talent continues to evolve and evoke. It doesn't hurt that I was able to set eyes on him in person and even have a brief (oh, so brief) conversation. You can check out that conversation (not the awkward one in the elevator...another story for another day) here. Of course, Merriman (with all his flaws) furthered the thaw. Having just been released from prison, he is adamant about never returning. He is loyal to his team. They are his friends. They are his family. In the end, however, he carries out plans with the tactical precision of a military detail, and the unflinching nerves that one would require. Apart from robbing banks, Merriman is a fairly good guy who lives a pretty clean life. He works out and tries to live decently. Again, aside from the whole "bank robber" thing. Contrary to Merriman (and, other Outlaws), antagonist "Big Nick" comes on the scene clearly hungover (evidently from more than just booze). He's unkempt with the scruffy, unshaven, bloated face of a grotesquely unhealthy man, and a cigarette hanging out of his (presumably unbrushed) mouth; unabashedly eating a donut from the dead guard's box that has been splattered with blood (on the box; not the donuts...that would be particularly beastly, but give him a chance as he gets there). Nick is such a hot mess, one would never imagine that he has a lovely suburban home, a wife, and two daughters; but, he does! Of course, his disgusting nature (of a human being, but, ok physically, too), and the fact that part of his "job" keeps him out at night drinking, gambling and doing drugs with hookers present (and he accidentally texts his wife about one's hotness) removes that incompatible piece to this puzzle. He is all alpha, and all in to win. He's also under increasing scrutiny for his (and his team's) unorthodox, and downright questionable tactics. Butler is invested as ever in the role of Nick. After "sitting on the script" for a bit, he read it and was instantly enthralled. He was so passionate about the project that he remained an integral part, unrelentingly, until it became a reality. Even being told that it was time to throw in the towel. You can hear all about it as Butler discusses with us whether there was a time he thought it might not come to fruition in the interview on our YouTube channel. Although not actively involved with the film as long, Curtis "50 Cent" Jackson (Power; Escape Plan; Southpaw) was reading all sorts of material in search for meaningful projects that inspired him as he set his sights on spreading his talents to acting. After going through Christian's meticulously thought out production book, he wanted in. It would be another six years before he would discover that the film had inched its way closer to production, and have the opportunity to "plant his flag" to be in the film. Curtis is fabulous as Enson, one of the Outlaws. Enson played football with Merriman in high school; and, they served together in the same military unit. Enson is the anti-Nick. He, too, has a nice house in the suburbs where he lives with his wife and kids. He actually spends time there, and with his family. He works out in the home gym that he has in his garage. That's where the crew is when a young man comes to pick up his daughter for a formal dance in a scene that is funny made funnier by Curtis' spot-on delivery of the overprotective father (and friends). I love 50 for this scene alone, but oh! he brings so much more! Then, comes the heist to end all heists. Merriman has insider information from a solid source that will send the Outlaws on an escalating game of intimidation and dupes that will leave you questioning everything you thought you knew was happening. He brings Donnie Wilson (O'Shea Jackson, Jr.; Straight Outta Compton; Ingrid Goes West) in as the driver. Donnie can drive ‘em, fix ‘em, rebuild ‘em...the "audition" ride on which he takes Merriman proves his worth to the team and the audience. It's a fun ride, and fun to see Donnie be smooth and skilled. Donnie's a hapless bartender who went to prison after receiving the "highest speeding ticket in California's history." Donnie impresses his friends that drink at his bar with his ability to keep tabs on all the patrons' orders. After landing on Nick's radar, he gets taunted before getting clocked and...well, abducted. Nick and the Regulators beat what information he has to give, and enlist him as their inside man. Nervous that he'll be discovered by the Outlaws, poor Donnie ends up getting smacked (literally, and figuratively) around by both sides for the better part of the film. He sweats every risky task he's entrusted with when "he's only the driver." Something that he'll repeat in the film, but will say in regards to filming, as well. Surprising the screening audience, O'Shea and 50 discuss the physical training including weapons that they had to endure "boot-camp style" in preparation for the film. It's entertaining to hear them rip on the burning question of why O'Shea had to partake in the training when "he's only the driver." If you, or someone you know, is skeptical about whether O'Shea possesses acting chops beyond portraying his "Sr self" in the biopic Straight Outta Compton, skepticize no more. It is only as the story develops, the plot thickens, and the characters evolve (and, divulge) that one increasingly realizes how astute a performer he is making choices that help create a more complex character full of nuances that might go unnoticed. Whether you're a fan of Dr. Hasslein, Victor Newman, or have no clue; Ziggy Zerhusen can't go unnoticed. Ziggy owns the bar which Donnie tends and is portrayed by none other than Eric Braeden (Escape from the Planet of the Apes; The Young and the Restless). In addition to a distinct voice and commanding presence, he happens to be the father of the film's director, Christian Gudegast. Gudegast manages to put the audience at the center of the action in a very real and intimate experience. Not just the usual "loudness" of an action scene, but a crisp realism that makes you feel surrounded by and part of every moment...every move. The intimacy extends throughout the film as the audience grows to know the characters, and becomes vested in them beyond their control. The empathy reaches untenable heights as the best of plays begin to devolve. I think I've done it! I think I've managed to avoid saying everything that I wanted to say, that needs to be said in an effort to keep key details under wraps for the ensured enjoyed visceral experience that you deserve. Whether any of it makes sense at this point, hopefully, I've impressed the quality of filmmaking and performances puts Den of Thieves on your "must see" list of this weekend.